Trevelin: a Welsh-look mountain village - Trevelin, Patagonia, Argentina. Just from the road the green valley surrounding Trevelin traps you. Surrounded by the mountains of Chubut, the entrance to this small town is still nicer. Quiant streets populated with rose gardens and its main feature: the typical houses and its famous Welsh tea. 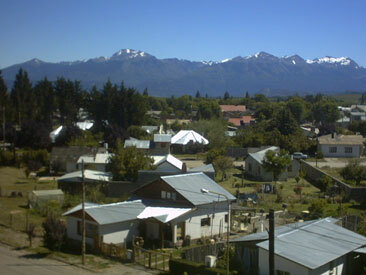 Trevelin is 22 kilometers from Esquel, the mountainous main city of the province of Chubut. It is located in the Valley October 16, settled in the late nineteenth century by Welsh settlers. As mentioned, the main attraction of this picturesque village are tea houses. Thousands of visitors come each year just to get through a day in the Welsh customs and enjoy thoroughly all the delicacies offered by these bastions of the European tradition. There the tourist can take his time while tastes the tea, tries the classic black cake, breads and scones all homemade and tastes delicious sweets made with fruit and herbs from the region. It can also enjoy the tasteful and typical decoration of these houses. Of course, their natural enclave surrounds nearby the city of cypress and beech forests, the Futaleufu River, the lakes of Los Alerces National Park, as well as the Aboriginal colony Lago Rosario next to the lake of the same name. In this site it can be found besides the convenient facilities to stay, good restaurants and grills, and tourism services willing to bring you the best attractions. From Trevelin, you can leave for other tourist spots in the region: the Los Alerces National Park, Nant and Fall Waterfalls, lakes Futalaufquen, Verde and Menendez, and the Futaleufu river and dam. Trevelin is named after its name of Welsh language that is preserved there until today. "Tre" means people and "Velin" means mill. And this meaning reflects the activity that its inhabitants were devoted and dedicate today, livestock, besides tourism. Back in 1885, a contingent of fifty Welsh families arrived from the coastal region of the province of Chubut, they occupied one of the most picturesque and fertile valleys of the mountainous area and continued with their proposed objectives at the moment of leaving their native Wales in 1865: preserve their traditions, language and religion. After more than a century, these objectives are fully achieved, as you can observe in the community and even in the younger generations, the daily practice of language, customs and religion (Protestant). All these cultural traits leave to Trevelin an imprint that is clearly noticeable in the architecture of some houses, the old Welsh chapels and cultural activities such as meetings of choirs and the Eisteddfod, a contest of poets that is traditionally performed by the Welsh people for several centuries. Therefore, although Trevelin provides an interesting access to adventure tourism and ecotourism, it is one of the few towns in the mountains that, in addition, can provide a more interesting appeal to cultural or historical tourism. The "Welsh epic", the name given to the migration of this community in Chubut, recognizes episodes worthy of the best films. In the Valley October 16, it was held one of the determining factors for the settlement of border disputes with Chile as the Referendum of 1902, which was held in the School 18, where the inhabitants, mainly Welsh, chose before to representatives of both countries and the British Crown, because the territory in which they lived belonged to Argentina. Figures such as the Perito Moreno were major players in these events, and his writings were registered to carry out the accurate predictions about the potential that this region offered for tourism and its natural resources. Tours from Trevelin Incredible places to know the geography and life of the mountainous region where it is the town of Trevelin. Welsh tea: a treasure preserved in Chubut One of the enticing activities that Trevelin has to offer to its visitors: drinking tea with a delicious cake in the traditional houses dedicated to the field. But historically, it has the importance of having been used by the Welsh to create solidarity with the natives. Culinary tradition: the black Welsh cake Despite its name, it must be said that the recipe came from the creative combination of ingredients in the few colonies in Argentina. Ternero Cordillerano Festival in Trevelin Since 2008 it takes place in Trevelin the Ternero Cordillerano Festival, a feast that highlights the camper activity and traditions of the locality. Tulips' Cultivation In the month of October the city of Trevelin wears colors when the tulips bloom, which has become a major tourist attraction for tourists that each year come to observe the beautiful tulips. Expo Fair of Trevelin Trevelin Expo Fair is an event that combines the production, history and creativity in a single framework which is the city of Trevelin. The Eisteddfod of Trevelin A Welsh tradition that came with the colonization of Chubut in 1865 remains intact in the city of Trevelin. The Eisteddfod is a literary-cultural event involving artists from the region, country and the world.